A: According to our tradition, Rosh Hashana is when God decides how our year will unfold: who will live and who will die, who will struggle and who will succeed. Coming in such close contact with death and illness on a daily basis definitely adds meaning to my prayers and enables me to connect on a personal level to every word that I sing. Q: Do you turn your cell phone or pager off during High Holy Day services? When I am in Israel, I'm on call 24/7; it doesn't matter if it's Rosh Hashana or even Yom Kippur. I'm always connected to the United Hatzalah GPS system that informs me whenever I am close to an emergency. But when I'm performing at a concert or leading prayers at a synagogue, I try to only take calls that are actual life and death situations. If someone's life is in danger, I will drop everything, jump on my "ambucycle" and be with them in less than three minutes. Q: Have there actually been times when you’ve had to respond do a call during a service? 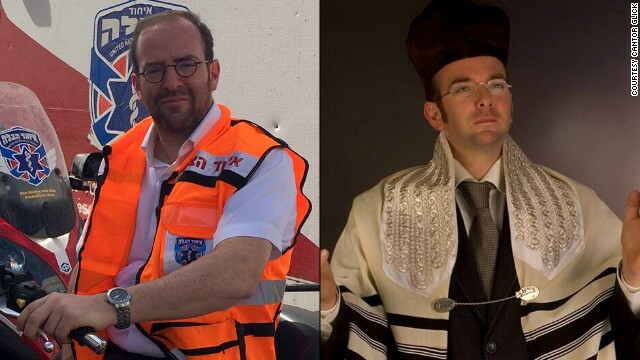 I was once leading a Rosh Hashana accompanied by a choir in huge synagogue in central Israel when all of a sudden a man in the congregation collapsed in cardiac arrest. I stopped the service and ran over to help. After 10 minutes and with the help of a defibrillator, I was able to shock him back to life. Q: Has a patient ever asked you to sing? One time, I was informed that a young man was standing on a rooftop in Jerusalem threatening to commit suicide. Paramedics, the fire service and the police where on scene preparing for the worst-case scenario. He had locked himself on the roof, and police were frantically trying to convince him to come down. I was standing and watching when his father spotted me in the crowed and told me that the boy loved cantorial music and had owned all of my music. I was sent up to the roof, where I counseled him. We eventually agreed that he would come down. Q: Is there a particular song that you really enjoy singing during Rosh Hashana? There is one prayer that is truly the pinnacle of the Rosh Hashana service, in which the cantor recites the words "On Rosh Hashana, it is decided who will live and who will die." It is the most moving part of the service, and I am always touched by this prayer. Q: So what’s more exciting, helping save a life or singing for high holiday services? It is extremely exiting to sing in front of a large audience or to lead a large congregation in prayer. It is my life’s work. But nothing can compare to saving a life.